Regular readers of Top Secret Writers know that I recently reviewed the documentary The Bridgewater Triangle. One of the reasons I was so fascinated by the documentary was due to the fact that I had developed an interest in the Bridgewater area of Massachusetts back in 2010, when I was hunting around for local areas with unusual phenomenon to investigate. We were planning a historical research trip to the Plymouth area, and so I dedicated one day to drive over to Bridgewater and do a preliminary drive around the area known as the Bridgewater Triangle. As I mentioned in my review of the documentary, having grown up in Northern Maine where you can hike through the woods for days before reaching any sign of civilization, I was somewhat disappointed by how built-up this area in Bridgewater actually is. My first opinion of the area was that it couldn’t possibly be isolated enough for any phenomenon to go unnoticed by locals living in the area – and that there should be far more sightings than are currently reported. However, keeping an open mind, I drove to a location where the high-tension lines intersected Route 24 – providing a perfect hiking opportunity along the high tension lines, and then south along a dirt road labeled “Hall St” on the maps, and then south through the thick of the isolated forest area – hopefully finding some small trail that went deeper into the forest. Unfortunately, there was far more traffic than I had anticipated, and no good parking area, so we decided to drive South to route 104, and finally up a dead-end road that would take us right up along the midsection of the Eastern shore of Lake Nippenicket, where hopefully we could find some good hiking trails that would take us deep into the forest around the lake. 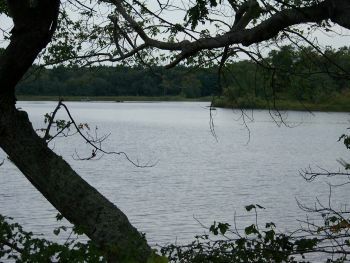 Before visiting the area, I had found a number of witness accounts claiming that the area around Lake Nippenicket and the bordering Hockomock Swamp, is quite haunted. Hockomock Swamp is renowned among Bridgewater Triangle enthusiasts as being at the heart of the paranormal hotspot. I was most interested in getting access to the Hockomock Swamp, as I had read accounts from people claiming that they felt “watched” while hunting or fishing in the area. There have been sightings of a variety of Bigfoot creatures – everything from a red-haired bipedal creature to a short, ape-like creature that attempts to communicate with people. It was so bad in the 1970’s that the local police even staged a hunt for a “giant bear” that many residents had reported spotting. There have been reports of huge birdlike creatures, panthers, massive snakes, and more. The alleged paranormal activity in the area goes all the way back to colonial Native American tribes, who considered the area sacred. Historically, the name of the locations even infer that it is a place of spirits. On a more realistic note, there are also reports of Satanic cult activities that go on even today. My own interest in the area stems from my ongoing exploration of such areas using scientific tools and procedures to measure environmental factors like electromagnetic levels and atmospheric conditions at the time of sightings. During this trip, however, all I had brought along was a camera, since this was to be a preliminary trip to scope out the area. 1. Local resident John Baker reported seeing a large, hairy beast along the shoreline while he was canoeing near the swamp. 2. Very large Pterodactyle-sized birds flying over the swamp with wingspans ranging from 8-12 feet. 3. The uncovering of an ancient Native American burial ground on Grassy Island. 4. The Wampanoag Native tribe avoided the swamp, believing it to be “the place where spirits dwell”. What type of spirits remains an open question. Looking at the lake from the car, I could see why there would be so many legends surrounding the lake. The trees, the foliage and the fact that the lake is surrounded on three sides by a fairly large forest makes for a feeling of isolation and foreboding. Not exactly evidence of paranormal activity, but the feeling while driving along the lake was palpable. I chalked it up to the overcast weather, and continued driving until we arrived at a dead-end. Off to the right, I could see a very large, very old mansion – clearly an estate that dates back to colonial times. As I’ve mentioned many times here on TSW and elsewhere, I can be quite skeptical and rarely succumb to “odd feelings” when exploring places like this. I’ve spent many hours exploring the isolated forests behind my house when I was younger, so there isn’t much in the forest that would unnerve me. However, there was something odd about this house. I couldn’t put my finger on it, but the house and the land around it was quite creepy. Getting out of the car, I backtracked down the road to the entrance of the property, and noticed that there was a company looking to subdivide the land into a new development of homes. Looking at the property, I have to admit the first thought in my mind is that I would never, ever buy a house located on this land. No doubt about it. The house itself is stunning – very beautiful and large. But the land…there was this feeling of decay and loss. It was also very confusing, because there was this big “No Trespassing” sign nailed to an ancient tree by the road, yet no more than 10 to 20 yards further down the road away from the home is the sign that the land is a natural preserve, and that the public is welcome so long as there is no hunting or camping conducted on the property. I made note of the location on my phone in order to come back later for a hike, as we had to get going on our way back home. I told myself that I would get back to this property at a later date to determine what the estate was and why such an amazing mansion would remain deserted. Returning home, I got distracted by other projects – although the Bridgewater Triangle has remained on my list of top locations to investigate further. It wasn’t until this year that I finally got around to digging further into the property that I had located, and was surprised with the findings. I soon discovered that the beautiful home and creepy grounds are known as the Keith Homestead. The 14-acre property and the home – built in 1783 – has been deserted for years, and the lack of development is blamed on the burst real-estate bubble by the local media. In 2012, the private owner of the property was looking to sell it. The town had already approved the property for a 10-lot subdivision. Since that sale never materialized, the town moved in and used its Community Preservation funds to purchase the property. The Keith family had owned the property up until 1948 before being sold out of the family. The town and the Department of Fish and Game purchased it for $1.4 million. Under terms of the preservation restrictions put in place, the home can never be torn down. That was in 2011. By August of 2012, the town had put the Keith Homestead property up for bid, and it had a total of zero buyers. Town Manager told local media sources that the lack of bidders surprised him because “dozens of people” had expressed interest. The town then dropped the minimum bid from $299,900 to $269,900. After visiting the area myself, I’m not surprised at all that there weren’t any buyers. Everything about the property screams, “stay away”. After I discovered the town’s Facebook page where the town was asking for people to share memories of the old Keith Homestead, local resident Paul Dunn shared the sort of information that you don’t hear about when you read the local media accounts about the homestead. Possibly haunted by Rev Keith. I think Mrs. Beaton told me a long time ago, that the jewelry and other things that were found offensive in colonial times was swiped off the bureaus and into the trash all the time…. and noises from the upstairs of footsteps pacing back and forth. Sure enough, a home that I had inadvertently discovered on my trip to explore the supernatural area of the Bridgewater Triangle – a home and a property where I could feel a very palpable sense of foreboding – turns out to have ghost stories associated with it. Interesting. Exploring the property in a little more detail, I discovered that behind the property, deep into the brush and thicket, are some obvious structures that have become overgrown with the surrounding foliage. Looking closely at the satellite view, you can easily make out the clear line of a row of outbuildings or some other structures, lined up in an unusual layout. It would be interesting to explore what those outbuildings are – left over structures from the Underground Railroad? The Keith Homestead is rumored to have been one of its stops. Or is it just simply a series of outbuildings gone into decay over the years? Nevertheless, the haunted Keith Homestead will likely become an enduring paranormal mystery, just like the rest of the spirited land and forests that surround it. What is the truth Sam.